Got plans Saturday? Look no further for your guide to a lively lunch spread for the Cinco de Mayo holiday. Reflective of summer's bold yet reawakening entry, the color palette and fresh menu provide the perfect excuse to sit back, sip a white sangria margarita, and enjoy a sunny weekend surrounded by great company and excellent ambiance. 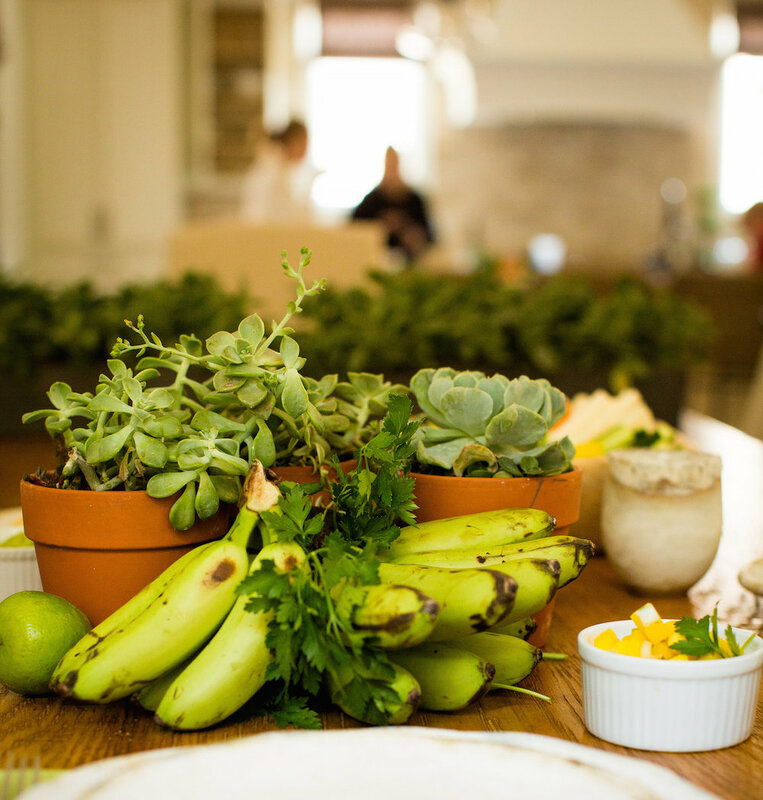 Inspiration for the dining room table's centerpiece was found in the organic mini green banana bunches at the grocery, whose taste is extra sweet and whose color brought a vibrant green hue. Then, I scattered wild succulents in terra cotta pots in an effortless bunch center-stage. Cilantro, avocados, limes, and other leftover menu ingredients were tucked in the negative spaces. The finished product was an organic Cinco de Mayo dream! 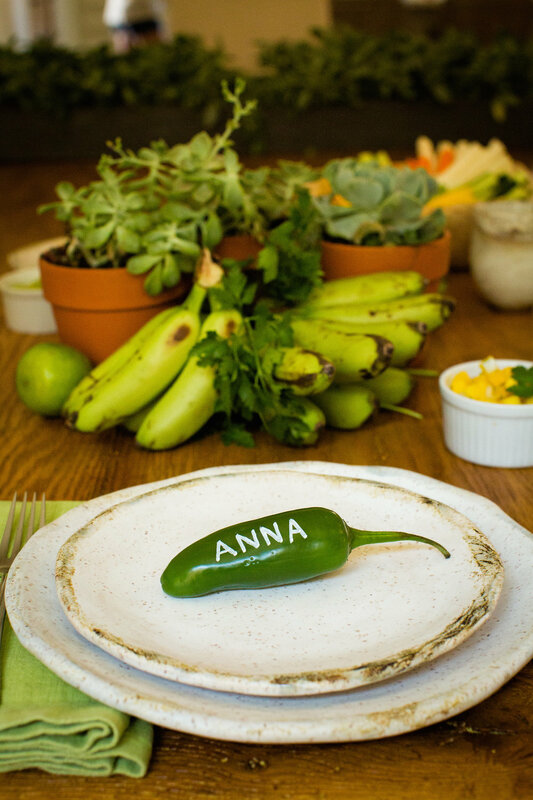 Each place setting received an Etta B Round Dinner Plate and salad plate, topped with a paint pen-inked fresh jalapeño for thematic place cards! Encourage your guests to take their jalapeños home for their next batch of guacamole or spicy margaritas. To kickoff the party, a large crudité display awaited guests at the kitchen island. Served in the root wood medium serving bowl, the raw and organic look was totally in-line with party vibes! I sought a casual and playful atmosphere with reminders of Cinco de Mayo's roots and modern applications. Pineapple mango and avocado dipping sauces for the crudité added pops of yellows and greens to a typically neutral kitchen. Most importantly, y'all asked for a taco recipe (versus a tostada) on my latest Instagram poll, so I had to deliver! These slow-roasted carnitas tacos are served on corn tortillas with roasted cubed sweet potato, avocado slices, pickled red onion and a dollop of créma and cilantro. MagnÍfico! You can pick up carnitas from the shop if your schedule doesn't allow for a slow-paced roast, but a crockpot will deliver magic in a matter of 6-8 hours on low. A squeeze of lime before the first bite brings out the best of the ingredients, in my opinion. The combo of an Etta B Round Dinner Plate and Root Wood Serving Tray/Charger is a stunning setting for this colorful party pleaser! Grab the recipe for white sangria margaritas here.